Nothing puts low-down varmints in their place or meat on the table with more style than the All-American lever-action rifle. What are the great repeaters? By any stretch of the imagination, the lever-action rifle should have been consigned to the ash heap of history long ago. By most accounts, it’s not as accurate as most bolt-actions, and at the same tick it most certainly is not as fast shot to shot as almost all semi-automatics. It might bend some shooters’ noses out of place, but the lever-action is an anachronism in comparison to today’s technology. Almost any job you’d demand is done better by a more contemporary design — and almost certainly taxes your wallet less. So, kickback and take a gander at 7 of the greatest lever-action rifles to ever sling lead in high volumes. These are war winners, nation builders and deer slayers, one and all. And they are more than enough proof as to why technology dating to before the American Civil War continues to light a flame in shooters’ hearts today. Perhaps the most sought after gun in the Civil War, the Spencer Rifle (and carbine) gave soldiers a decided edge in battle. With seven rounds of .56-56 Spencer rimfire on tap, the rifle could lay down a higher volume of fire than nearly anything it was likely to meet on the battlefield. Unique in design, it was among the first repeating rifles adopted by any military in the world, and was the second-most used carbine — behind the Sharps — in the War Between the States. In addition to being fast firing, it was also quick to reload. The tubular magazine in the buttstock made it easy to reloaded on horseback, particularly with the aid of a Blakeslee cartridge tube. While not as common today as other rifles on this list, the Spencer is still alive and kicking. The fascinating lever-action is often rattling off shots at Cowboy Action shoots, and replicas are available in more common chamberings, such as .45 Colt. For all intents and purposes, the Henry Model 1860 is what kicked off America’s love affair with the lever-action rifle. But it did plenty to spur the romance, tipping the scales for the Union soldiers lucky enough to take them into battle during the American Civil War. Able to spit out 16-rounds of .44 Henry rimfire in the blink of an eye meant few soldiers armed with a brass-receiver beauty would be outgunned. Unfortunately, there were relatively few soldiers who got their hands on the iconic lever-action rifle, given they had to spend their own hard-earned pay to procure one. Its popularity continued after the war, a staple of cowboys and settlers throughout the American West. And still today, originals and replicas are among some of the most sought after lever-actions around. It’s not hard to understand why. Aside from history, the Henry 1860 is an absolute knockout in the looks department. Outside of the Colt Single Action Army revolver, few firearms encapsulate the American Frontier more than the Model 1873. After all, it was “the gun that won the West.” That is a vast overstatement of the lever-action’s role in history; nevertheless, with more than 720,000 manufactured over a 50-year production run, it was among the most ubiquitous and useful rifles of the era. Similar to the Henry 1860 in design and operation, the rifle had some notable design enhancement. Its iron receiver was it most weighty. This simple change in material allowed the rifle to digest the more powerful loads available at the time. On top of that, chambered in .44-40, .38-40 and .32-20, the rifle gave its owner plenty of flexibility in the sparsely populated American West, since the cartridges were also popular revolver rounds. Today, the Model 1873 is as popular as ever, and not just the highly collectible originals. Uberti USA, Cimarron and good old Winchester all produce the iconic rifle. And it’s safe to say, as long the Cowboy mythology lives on in America, so will the ’73. As is apt to happen on any gun list, John M. Browning’s name is going to be dropped sooner or later. In this case, it’s in conjunction with perhaps the most prolific lever-action rifle of all time. The Model 1894 was the first sporting rifle to sell more than a million. And now, more than a century into production, that number is right around the 7.5 million mark. What brought it to such prowess was the lever-action’s power, with Winchester embracing the emerging firearms technology of the time — smokeless powder. Originally chambered for blackpowder cartridges — while kinks were worked out in the smokeless powder variations — the rifle would go on to be chambered for the high-pressure rounds. Chief among these was the .30-30, which when matched with the ‘94 produced one of the most prolific deer rifles of all time. But the Model 94 also had its role in the Wild West. For better or worse, the likes of Tom Horn, Jr. wielded the mighty lever action. And there was more than one rustler run off with a well-aimed shot from an 1894. Of all the lever-actions on the list, the Savage is the one that holds my heart. There’s a simple reason for this: I have one in my gun safe, given to me by my father, who was gifted it from his. But the 99 needn’t have a family lineage to be appreciated. Among the finest and forward looking production guns to ever come down the pike, the lever-action is at the same time well made and elegant. Aside from the hand fitting and the hand checkering on pre-1965 models, what catches the eye on the Savage 99 is its innovative rotary magazine (though there are late models with detachable box mags). Simple as it might sound today, this revolutionized lever-actions, allowing them to harness the ballistic advantage of spire-point bullets — a dangerous no-no for tubular magazines. Additionally, the 99 is hammerless. This means its coil mainspring had a lightning-fast lock time, comparable to the ascending bolt actions of the day. If all of that weren’t enough, the rifle came in a slew of chamberings in its 100 years of production, including the revolutionary cartridges of Charles Newton and Arthur Savage himself. While not true across the board when it comes to 99s, with the right cartridge, and a steady hand, it is among the most accurate lever-actions ever produced. While many of the guns discussed on this list saw their heyday more than a century ago, these Marlins are different. Advancing the lever-action design in 1948 with the introduction of the 336, the company kept the style of rifle relevant to hunters seeking more than simply nostalgia afield. Boy howdy, did they ever. The .30-30 and .35 Remington 336s are more than competent deer rifles, able to accept scopes and a dandy in thick timber, where maneuverability is key. To boot, the 336 was more reliable than ever, with an entirely new rounded bolt design, enhanced extractor and modified cartridge carrier. The 1895, which utilizes a 336 action tweaked to handle the .45-70 cartridge, did the same, but in a chambering meant to handle more substantial game. With devastating short- and medium-range potential, the 6-round ’95 has become a trusted insurance policy in bear country and a staple on antlered game from moose on down. The Browning BLR is truly a different bird. While it looks like a modern iteration of a lever-action rifle, its operation and action are anything but. The BLR’s action is almost more bolt-action than it is lever. This is due to a rotating bolt head that secures locking lugs in the breech, similar to a good old turn bolt. The result is a rock-solid action, stiff enough to enhance the overall accuracy of the rifle. This means the BLR isn’t just for short- to medium-range work, giving shooters the ability to reach out on those long shots many would be hesitant to take with some other lever-actions. But the BLR’s accuracy isn’t the only aspect that makes it a jewel. 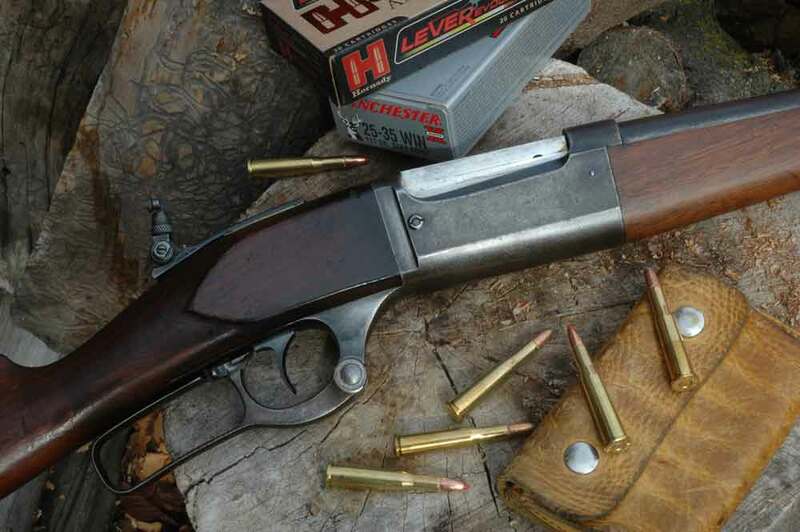 Its operation might be among the best in the lever-action world. Browning accomplished this with the rifle’s rack-and-pinion design, which allows the trigger to move with the lever. This all but eliminates the dreaded finger jam, the bane of follow-up shots with lever-actions. The BLR may not have the nostalgia of most other lever-actions, but given the performance of its modern design, that’s not exactly a bad thing. Love your rating of the 7 best lever guns. Would like to comment on my favorites. The 1895 Winchester is about the smoothest operating lever gun, and I collect these. Also, I would like to add the 71 Winchester which is a work of art. Thanks for the interesting article.